Whether you call us with a technical question, want to discuss an extended warranty or need repair work done in a hurry, we’re here to make sure you get the support you need! Non-Stop Support When You Need It. Reliant Finishing Systems has rapidly grown to become the leading name in the powder coating industry through a combination of great equipment and prompt, professional service after the sale. We understand that our job isn’t done just because your equipment has shipped, and the services we provide are just as important as the products we build. We offer a wide range of installation, maintenance, training and repair options so we can continue to support you for as long as you own our equipment. All of us at Reliant truly care about each and every client we serve, and we think it shows in the quality and value we strive to provide. We want you to be ecstatic about your experience with our company. Call us today or use the convenient contact form to get in touch, and let us know how we can help. Our factory-authorized installation technicians can get your system up and running as quickly as possible. We have a network of field techs that perform installations across North America and around the world. By coordinating installation services when you buy your equipment, you can save time and money by getting a crew to begin installation within days of delivery. A typical installation project includes assembly of your new equipment, interconnection wiring and materials, start-up and calibration, and basic operational and maintenance training. There’s no better way to learn about powder coating than to do it on your own equipment! 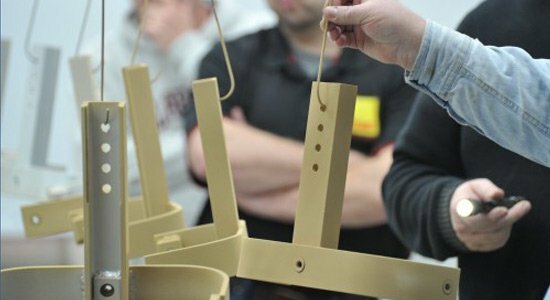 Our experts can quickly and efficiently introduce operators to the basics of powder coating equipment operation, as well as “best practices” for coating in their work environment. We also offer intermediate and advanced training for specific coatings or applications. Need to optimize your coating efficiency or troubleshoot a recurring production problem? Consider our in-depth line audits. A coating process audit from Reliant Finishing Systems provides in-depth evaluation of your existing coating operation, looking at every step of your process to improve efficiency and increase throughput. If you are having quality issues, our line audits can help identify them by diagnosing equipment errors that may be impacting your finished products. Whether your equipment was delivered by Reliant Finishing Systems or not, we can help your system get back to top performance. We have a dedicated support staff to make sure your equipment works great all the time. We build our equipment to last, but if something does go wrong we’re here to help you get running again as quickly as possible. Whether you need a replacement part, some advice over the phone or an on-site repair visit, our network of technical support personnel and skilled field technicians will work to get you the outcome you need as quickly as possible. We can also provide scheduled maintenance visits for equipment examination, recalibration and warranty extension.